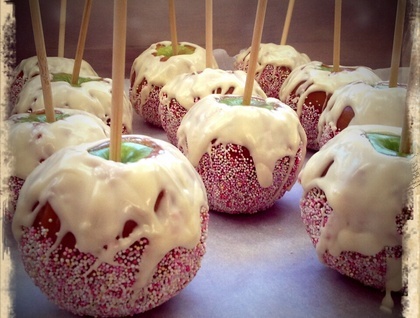 Step Five: Repeat after me - "An Apple a day keeps the doctor away"
WELCOME TO NZs NEW SENSATION OF CARAMEL APPLES! Remember the old bright red toffee apples we used to get at school and church galas when we were kids, bash them against our front teeth to crack them, then eat only the outer toffee and chuck away the rest? Well these aren't them! These have a caramel base to them, rather than toffee, making them softer on your teeth and paired with the tart Granny Smith, make a yummy treat! 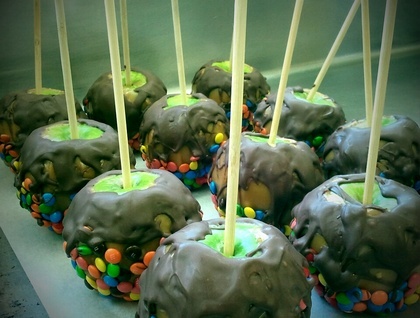 They are a big thing in the United States, known as Candy Apples, sold in gourmet confectionery shops and made on a more simpler scale by kids at Halloween as a Autumn treat. 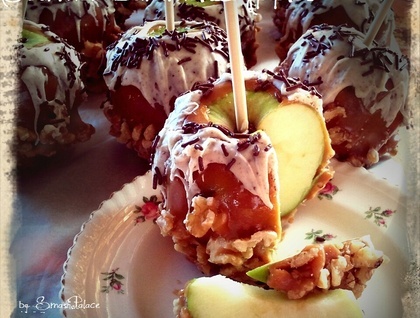 Apples are wrapped in cellophane bags with decorative ribbon. Orders are taken and discussed for flavours, numbers and delivery. If large numbers are required (>10) an agreement can be made for discount. Colours can also be discussed for weddings etc. Apples will last approximately 2 weeks unopened in the fridge. 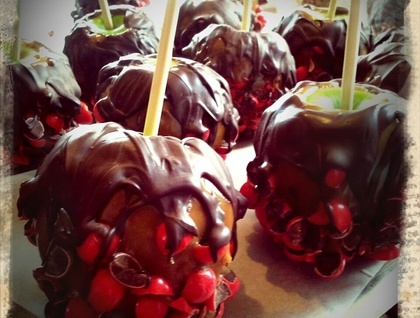 Once opened, like any other apples should be consumed before it browns. Brushing with lemon juice and wrapping remainder in Gladwrap will slow natural browning process. ** NB: Postage or Courier costs is dependant on number of apples, and destination. Allow for approximately $12 per order - quote on application. Apples are all individually bubble wrapped packaged in a box. Courier to the South Island is expensive and therefore NZ Post may be preferable. Manawatu and Horowhenua orders may be able to be delivered by arrangement. Contact jeanjeanie to enquire about payment or shipping options.